What is a Fuel Cell Car? Nissan’s about to turn loose a new Leaf, and while we only got about three hours of seat time during the recent press introduction, it was enough to justify this: The 2018 Leaf is a very good EV, better than its predecessor in every way. That’s only as it should be. Nissan’s sold almost 300,000 first generation Leafs worldwide since the EV’s introduction at the end of 2010. With that much practice, the second generation ought to really shine. The redesigned 2018 Leaf isn’t a rolling technology lab, like Tesla’s EVs, nor a full-on luxury machine like the plug-in models available from Mercedes and BMW. It won’t go as far on a charged battery pack as will Chevrolet’s Bolt EV. But for a mid-range, mid-priced EV that will serve most of the people most of the time, the new Leaf is in a class by itself. It does its job with comfort, a taut and compliant ride, plenty of oomph, a dash of exterior style, a respectable amount of range on a fully charged battery, and available diver assistance technology that keeps you centered in your lane and permits “hands-on” automated following – all the way down to a full stop – on the highway and in some crowded city traffic situations. A quick disclaimer, TheGreenCarGuy was an early Leaf adopter. We loved the 2011 Leaf and the all-electric driving it permitted. We even got used to the original Leaf’s somewhat polarizing pointy-nosed, tall-butted styling. That’s no longer an issue in the 2018 Leaf, which looks a lot like a mildly sporty compact hatchback. Blacked-out B and C pillars give it a “floating roof” look and the front end, while fairly nondescript, at least is devoid of the bug-eye headlamps of the first-gen Leaf. 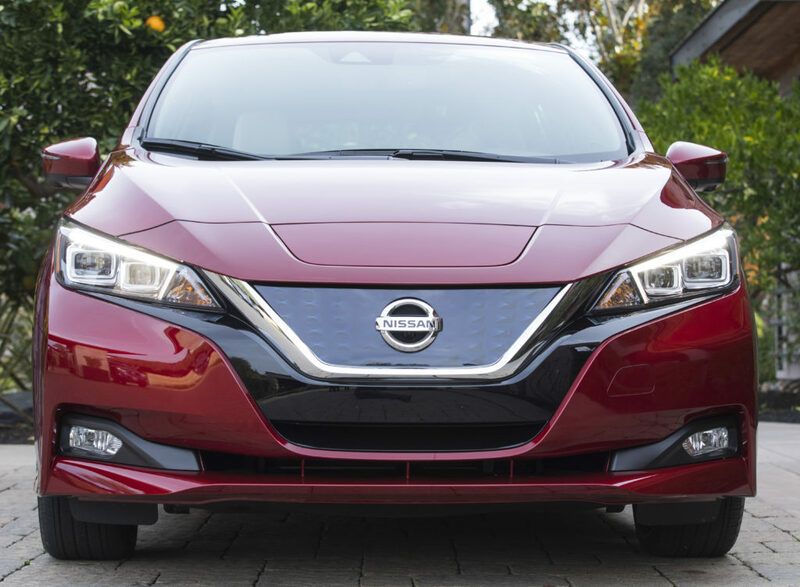 One bonus of the Leaf’s new look is that the charging port concealed beneath sheet metal on the car’s nose is mounted a bit higher than the original Leaf’s grill-mounted port. That makes it possible for taller drivers to plug in charging cords without having to bend down to reach the port. 2018 Leaf’s charge port is concealed under a hatch centered above the grill. What we didn’t care for in that first model was its range. The 2011 Leaf was EPA rated at just 73 miles of range per charge, and when you live atop a steep hill and do mostly freeway driving, 73 miles per charge is a seldom-obtainable goal. In 2014 we traded the Leaf for a plug-in hybrid because we needed more range but still wanted the joy – and fuel economy – of all-electric driving for short hops. 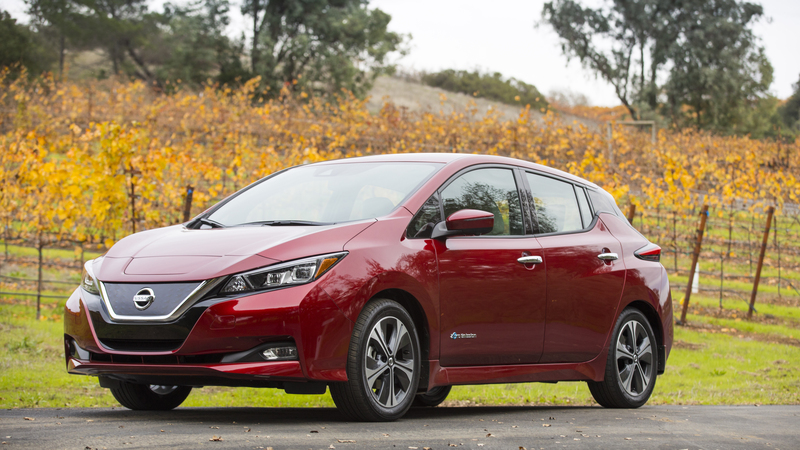 Over the years, though, advances in battery packaging and energy management have allowed Nissan to boost the first-gen Leaf’s range several times during model updates, to a high of 107 miles for the 2017 model year. The 2018 Leaf blows that away. That longer range is due to some new battery chemistry and cell-construction methods that combine to deliver greater energy density at less weight and mass. As a result, Nissan was able to fit the 2018 Leaf with 40 kWh of battery in the same space needed for older models’ 24- and 30-kWh packs. The new Leaf’s actual range will vary with load, road and weather conditions and individual driving styles – that’s the case with any vehicle and is especially true with EVs. But the mileage we rolled up on our moderately lead-footed test drive through California’s Napa Valley and into the Alexander Valley in Northern Sonoma County seemed to correspond closely with the remaining range estimates displayed in the 2018 Leaf’s driver info screen. That indicates that 150 miles in an average combination of city and highway use is likely doable for many. Most of us – even in Southern California, where long-distance commuting is the norm for a large part of the population – don’t drive 150 miles a day. The ability to do so without having to recharge should provide a comfortable cushion (and most people will recharge at home every night and not wait for the battery to be fully depleted). For longer trips a second vehicle with more range, likely a hybrid or internal combustion model – owned, borrowed or rented – would be necessary, of course. 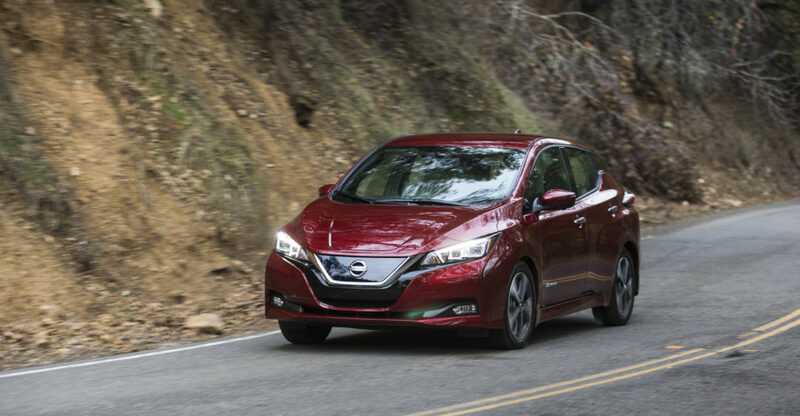 All three 2018 Leaf trim levels have the same powertrain and thus are rated the same for fuel efficiency and range by the EPA. If 150 miles just doesn’t cut it, Nissan says it will launch a 60-kWh Leaf in 2019 and promises more than 200 miles of range from that model’s larger battery. No information has been provided yet as to price or how a battery with 50 percent more capacity will impact interior space. The 2018 Leaf goes on sale in January and will be available in all 50 states. Nissan hasn’t provided a roll-out schedule, so we can’t say how soon or in what volumes it will show up in each region. As does its predecessor, the 2018 Leaf comes in three trim levels, blessedly with a minimum of special options and packages to muddy the waters. The base S model starts at $30,885. That’s $690 less than the 2017 base model and, Nissan says, includes almost $4,500 more in extra features and equipment. The mid-level SV climbs to $33,385, a wallet-pleasing $1,810 less than the 2017 Leaf SV and with a Nissan-claimed $5,000 in addition features. The top-of-line SL begins at $37,095, a mere $590 less than its 2017 counterpart, but with $6,783 added value, the automaker says. Prices cited include Nissan’s mandatory $895 shipping and handling fee but do not include any applicable federal, state or local incentives. Cargo area is deep and wide but the rear seats create an uneven floor when the seat backs are folded down. The 2018 Leaf is the second car in Nissan’s lineup to feature the ProPilot Assist package, a suite of safety-oriented technologies that can help make driving safer and more relaxing. The 2018 Rogue CUV, which went on sale in October, was first. ProPilot is not an automated driving system. It requires the driver’s full attention, and won’t work if the driver’s hands come off the wheel for more than a few seconds. I tried going hands-off and within about five seconds a warning light began flashing and an audible alert sounded. If your hands remain off the wheel, the alert changes from beeps to a klaxon-like wailing. Continue ignoring things – because you are asleep, unconscious or otherwise incapacitated (or just testing) – and the system turns on the car’s emergency blinkers and starts applying the brakes, slowing all the way to a full stop if there is no driver intervention. From first warning to complete stop takes less than a minute. What the system does do is combine a highly intelligent cruise control and automatic braking system with a camera-based lane keeping system. It works best on clearly marked roads at highway speeds and in stop-and-go rush-hour jams. It’s not good in city traffic because it can’t recognize and respond to traffic lights or stop signs. It also won’t recognize and follow most motorcycles, scooters or bicycles. ProPilot’s lane keeping assist works when the center-mounted forward camera identifies lane markers on either side of the car. That triggers sensors and servo motors that position the vehicle in the center of the lane and keep it there at all speeds unless the driver overrides with the turn signal and/or steering wheel, or the cameras lose the lane markers because they are worn away or obscured by weather conditions including snow and extreme glare. The basic rule of thumb is that if the driver can’t see the lane markers, neither can the camera. The other part of ProPilot is the radar-based automatic following and braking function. You set it up just as you would any intelligent cruise control, toggling it on with a steering wheel-mounted switch and setting a maximum speed and following distance. Where ProPilot Assist differs from most intelligent cruise systems is that when the vehicle in front starts slowing, so does your 2018 Leaf, all the way to a full stop. Many other systems are intended only for following at speed and shut down when speeds drop below a factory-set speed, usually in the range of 20 to 40 miles per hour. With ProPilot Assist, the new Leaf will automatically resume following after a stop if the vehicle in front resumes moving within three seconds. If the stop lasts more than three seconds, the system requires the driver to hit the “resume” button on the steering wheel to get going again. Nissan has also perfected the so-called one-pedal driving possibilities of the electric car with a new “e-Pedal” mode that comes as standard on the 2018 Leaf. It is toggled on with a console-mounted switch and when on and triggered by reducing pressure on the throttle pedal, uses a high level of electric motor regenerative braking to smoothly but rapidly slow the car to a near-stop and then bleeds in sufficient friction braking to complete the stop and hold the car motionless, even on grades of up to 30 degrees. One bonus of e-Pedal use is increased on-board generation of electricity that’s sent to the battery, boosting potential range. Using the e-Pedal mode to slow the new Leaf when driving on tortuous mountain roads replicates the handling benefits of driving and down-shifting a manual-transmission car, using the stiff regenerative braking power to modulate speed through the twisties and around corners imply by easing off the throttle. It takes a few minutes of practice to learn the Leaf’s behavior at various speeds in e-Pedal mode – how long, for instance, it will take to come to a complete stop at 30 mph so you don’t unwittingly blow through an intersection. 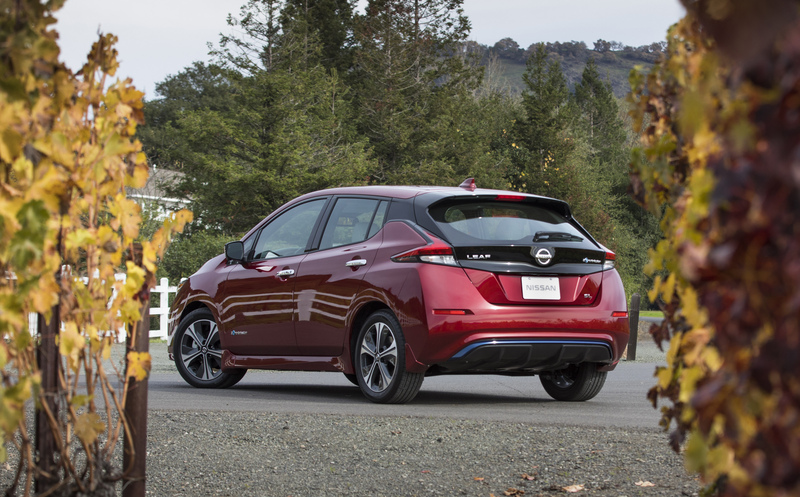 Once learned, it is a system that greatly enhances the Leaf driving experience. Another bonus: Master use of e-Pedal mode and avoid the need to make panic stops and you may never again have to pay for a brake job. EVs typically compete first on range and price, and in both categories the 2018 Leaf’s got a lot going for it. Of all the EV models in the market today, only the Chevrolet Bolt, rated at 238 miles, the new and still in limited supply Tesla Model 3 sedan, 220 miles, and the far more expensive Tesla Model S sedan and Model X crossover – rated at 237-317 miles, depending on model and trim – have more range. The 2018 Leaf starts at less than all but two of the EV models with competitive range. The 2017 Ford Focus EV (115 miles) starts at $29,995, or $890 less than the base 2018 Leaf. The 2017 Hyundai Ioniq EV (124 miles) starts at $30,335, or $550 less than the Leaf. Range ratings and base prices of the other members of the 100-mile-plus club are the 238-mile Bolt, $37,495; the 220-mile Model 3, $35,000; the Volkswagen eGolf, 125 miles, $31,315; the BMW i3, 114 miles, $43,395, and the (close enough to the century mark to get a pass) Kia Soul EV, 93 miles, $32,800. Nissan tinkered with battery chemistry, using a nickel-manganese-cobalt electrode for greater energy density, and with packaging, slimming down the separator membrane in each cell. That gives the 2018 Leaf a 40-kWh lithium-ion battery pack with the same number of cells – 192 – in the same size package as its predecessor’s 30-kWh battery. 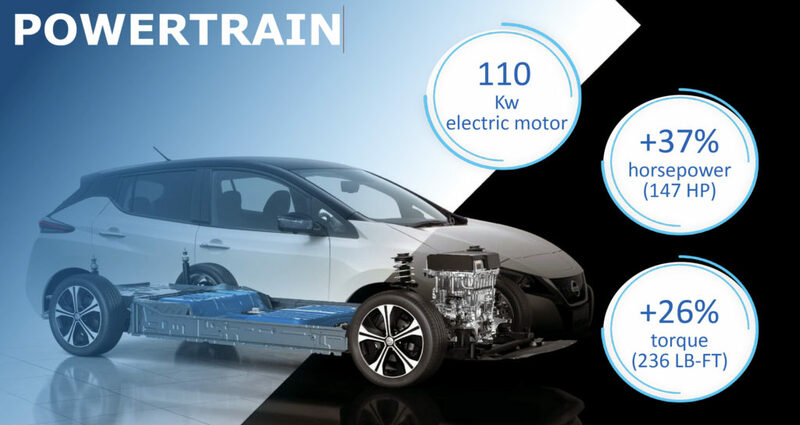 Nissan continues to eschew liquid cooling for its battery pack, relying on cell and pack design and ambient air flow to do the job. Some critics are concerned that battery performance degradation will be greater over time with so-called passive battery management techniques such as used in the Leaf. Nissan warrants the battery against defects for 8 years or 100,00o miles and will replace it at no charge if indicated capacity drops below nine bars on the 12-bar battery capacity meter display. The 2018 Leaf’s electric motor is the same as used in the 2017 model. But a new power inverter gives it a 37 percent bump in output, to 147 horsepower from 107, and a 26 percent increase in torque, to 236 pound-feet from 187 lb-ft in the 2017 model. All three trim levels of the new Leaf come with 6.6 kW on-board charging capacity, good for a 7.5-hour recharge of a depleted battery on a 240-volt, Level 2 charger but will take upwards of 35 hours on a 120-volt Level 1 (household current) system. The SV and SL trims also come with a DC fast-charger port as standard equipment, and Nissan is offering buyers two years of free use of the “No charge to charge” DC fast-charge and Level 2 network it continues developing in conjunction with EVgo. Presently, there are more than 1,100 DC fast chargers installed in the U.S. that are compatible with the charging system Nissan uses – and more are coming. To date, Nissan offers the “no charge” charging program in 55 major markets in 23 states and Washington, D.C. The 50-kW CHAdeMo protocol fast-charge system Nissan uses will add 88 miles of range to a 2018 Leaf SV or SL battery in 30 minutes, and 107 miles in 40 minutes. For a fuller explanation of charging levels and protocols, see our article on PEV charging. The 2018 Leaf can be ordered with a charging cord set that operates on 120- and 240-volts and can be plugged into existing properly sized wall sockets with the supplied adapters. Nissan also is providing a dual-level charging cord set, switchable between 120- and 240-volt circuits. Such cord sets are available in the aftermarket, but Nissan is the first manufacturer to bundle one with its cars. The system is standard with the SL, is part of the $650 Technology Package with the SV, and is a $1,590 option with the base S trim. The cord set can eliminate the need for a fixed charging station, making it easier for condominium and apartment dwellers to plug in. 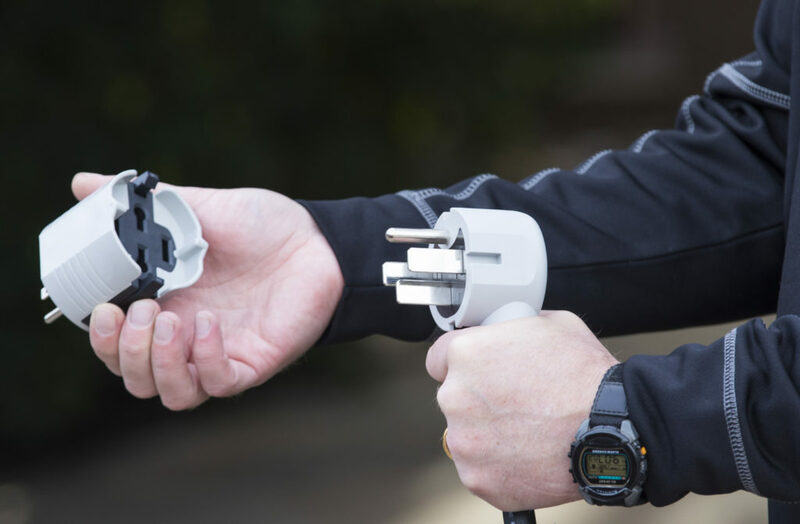 It’s also handy on trips, especially when there’s a conventional clothes drier outlet available as that’s the type of plug the cord uses for Level 2 charging. Nissan hasn’t released a full list of equipment and the base Leaf S wasn’t available during the press introduction. What we do know is that it includes 16-inch alloy wheels, black cloth upholstery, a 5-inch infotainment touchscreen and a 7-inch driver information screen, a tilting steering column, automatic headlights, LED taillights, automatic climate control, automatic emergency braking, power adjustable side mirrors, a rear-view camera, and Nissan’s driver-selectable “e-Pedal” system that enables the driver – after a bit of practice – to drive without using the conventional brake pedal in most instances. The mid-level SV trim adds 17-inch alloy wheels, the DC fast-charge port, a 7-inch infotainment touchscreen with navigation, piano black interior trim, a leather-wrapped steering wheel with integrated audio and cruise controls, Apply CarPlay and Android Auto compatibility, and intelligent cruise control. The top-of-line SL has adds leather upholstery, a seven-speaker Bose audio system, a 6-way power driver seat with 2-way adjustable lumbar support, heated steering wheel and front seats, heated outside mirrors, heating and cooling ducts for the rear passenger area, an energy-saving “hybrid” heating system, an auto-dimming rear-view mirror with HomeLink, blind spot monitoring, a surround-view camera and display, LED headlights and daytime running lights, and the portable charging cable. Options for the S trim include the $1,590 dual-level charging cord and a $450 All Weather package that includes heated outside mirrors, heated steering wheel, heated front seats and heating and cooling ducts for the back seat area. SV trim options include a $900 All Weather package that adds the power-conserving, heat-pump based “hybrid” heater (standard on the SL) to the base weather package for the S trim. There’s also a $2,200 Technology package that includes the dual-level charging cord , a 6-way power driver seat with adjustable lumbar support, and a suite of safety systems including an electronic parking brake,LED headlights with high beam assist, LED daytime running lights, an auto-dimming rear-view mirror with HomeLink, automatic emergency braking with pedestrian detection, blind spot warning, rear cross-traffic alert, and Nissan’s ProPilot driver assistance system. Options for or the SL trim include a $650 Technology package that adds the driver assist and safety items not included as standard: electronic parking brake, high beam assist, automatic emergency braking with pedestrian assist, and ProPilot Assist. 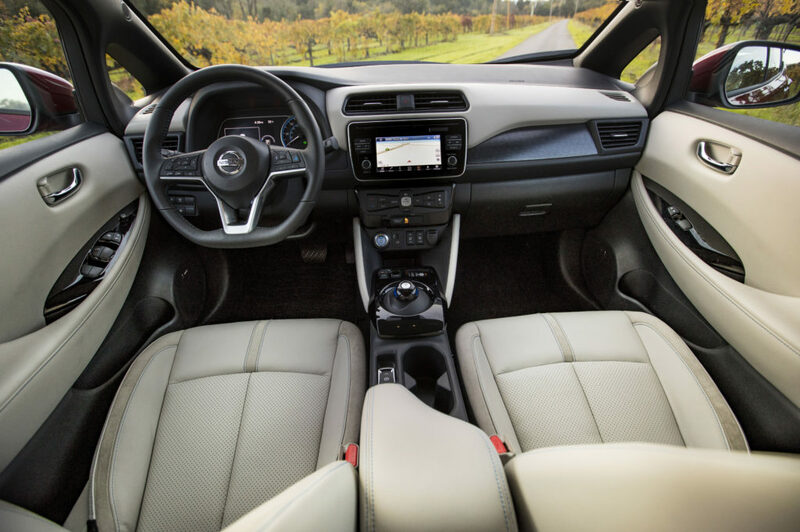 The 2018 Leaf’s interior is comfortable, modern, well-appointed and nicely laid out so that instruments and readouts the driver needs are convenient to the driver while other bits and pieces – from audio and climate controls to the pull-down center armrest and cup-holder tray between the back seats, for instance – are handy to the passengers they are intended to serve. We must ding Nissan, though, for eliminating the telescoping steering column, a money-saving move instituted halfway through the 2017 model year run. The fixed column can create difficulties for drivers with long arms and short legs, or vice versa. The dash is covered in a mix of plastics, all fairly hard. The 7-inch driver information screen in the instrument panel housing directly ahead of the steering wheel is easy to read and lets the driver easily scroll through a variety of info screens – including range estimates, driver assist functions and battery performance and electric powertrain details. Climate controls, infotainment, navigation and audio functions all are controlled from the centrally mounted touchscreen. 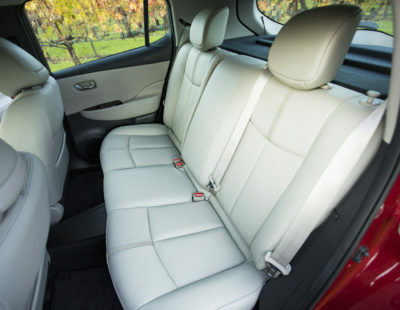 The split folding rear seats, as in previous Leaf models, are fairly flat and upright, but nicely padded and supportive and there’s plenty of head and leg room. The front buckets, in cloth or leather, are comfortable, roomy and well-bolstered and, while not sports seats by any means, will keep you secured when driving at speed on curvy roads. Overall length, height and width are just a tad bigger than the 2017 model, but the wheelbase is the same and all interior dimensions are unchanged except rear legroom, which grows a scant 0.2 inches. The cargo bay remains one of the Leaf’s strengths and weaknesses – it is fairly deep and roomy, but the location of the batteries means that the floor is quite uneven when the rear sears are folded down. 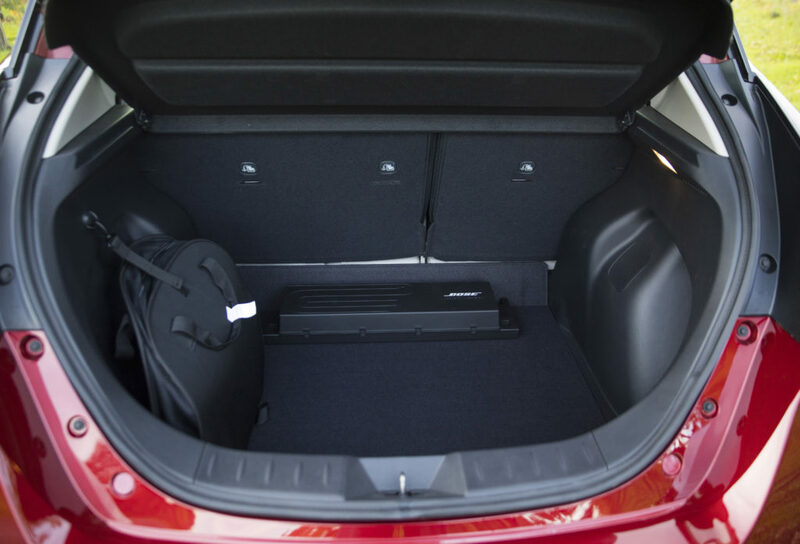 With seats up, the Leaf’s cargo hold measures 23.6 cubic feet. That grows to 30 cubic feet with both rear seat backs folded down. A low but long subwoofer supplied with the Bose sound system for the SL trim is mounted on the cargo floor. That slightly diminishes the SL’s cargo area and cuts down on the amount of flat floor area. More horsepower and torque,along with more refined steering – thanks to new software and stiffer suspension – make the 2018 Leaf more fun to drive than its predecessors. If you’re not into fun and consider driving merely a necessary chore, the improvements, especially wit the optional driver assist systems, make it a far less stressful chore than before. Master the e-Pedal mode and you almost forget you are in an single-gear electric car when driving the new Leaf on twisting roads – the absence of engine noise remains a dead giveaway, though. The ProPilot Assist system makes long drives a lot more bearable if you are on a well-marked highway, reducing fatigue and pretty much eliminating opportunities, due to inattentiveness, to rear-end the guy in front of you or cut off or sideswipe cars in adjacent lanes. We took a 2018 Leaf SL through California wine country for about 110 miles on a mix of canyon and mountain roads and relatively open freeway and found it to be stable, responsive, peppy and solid in all circumstances. The new Leaf ought to easily meet Nissan’s expectations for a big boost in sales in 2018. Has Federal EV Tax Credit Been Saved?